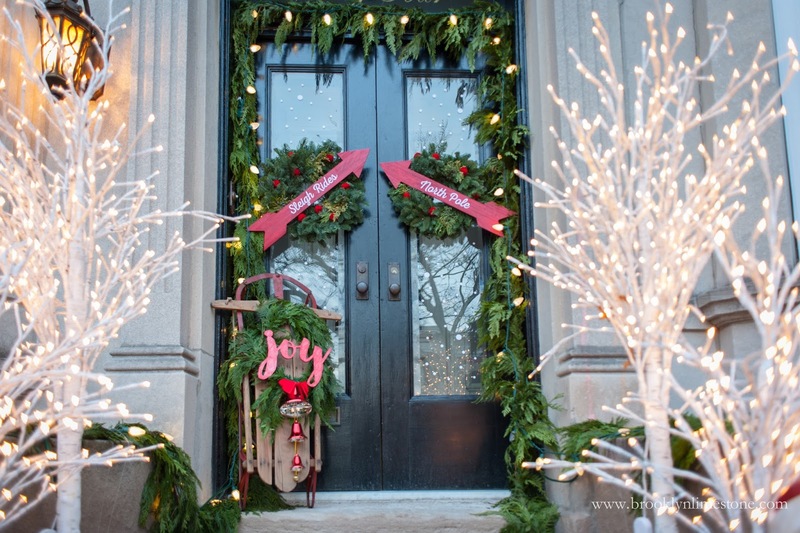 Christmas front door decor creates a festive holiday look and adds curb appeal to any home.  Use a combination of vintage and new for a welcoming feel. 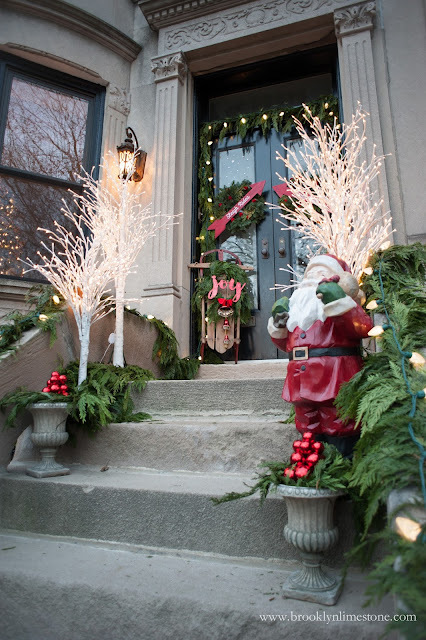 One of my favorite parts of this season is seeing how neighbors decorate their home. 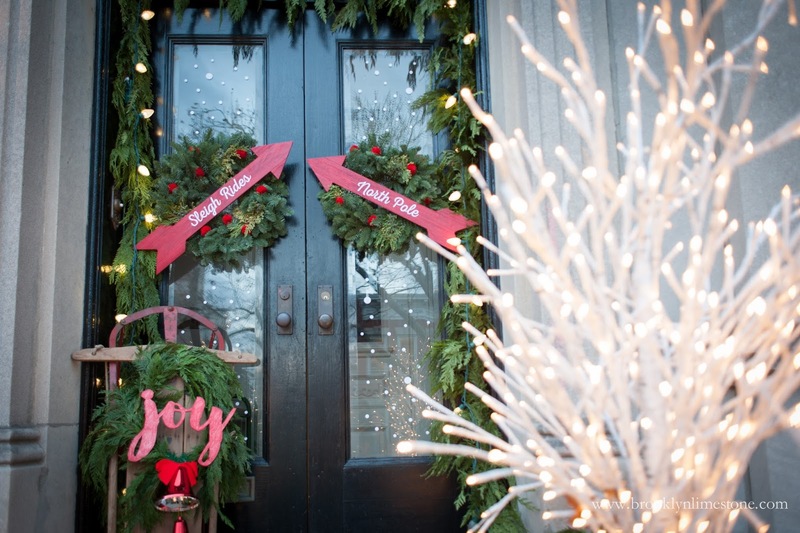 As far as I'm concerned, there can never be too many white twinkling lights., especially when you're talking about a Christmas front door. Am I right? This year I repurposed the wooden arrows I used in my Halloween decor to decorate the wreaths. The arrows add such a fun graphic element that bring the eye up from the sidewalk straight to the door that I love. My favorite part is the vintage sled that a reader was so kind to find for me last year. I made a mini wreath with leftover garland and put a Target dollar spot sign and some 99 cent store bells to finish the look. While I don't love it getting dark out at 4:30, I do love the bright glow I come home to every evening. 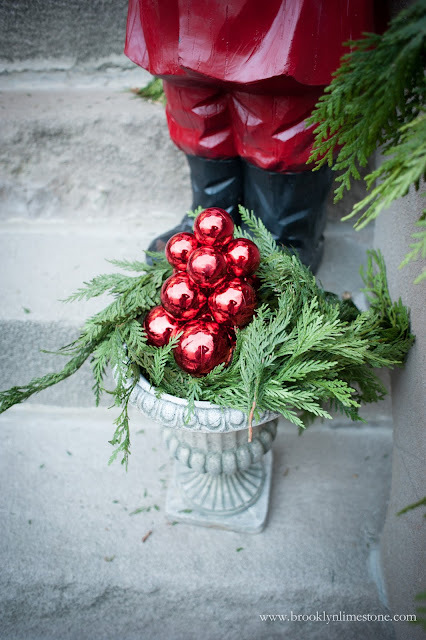 My outdoor decorations are definitely the last to come down around here! 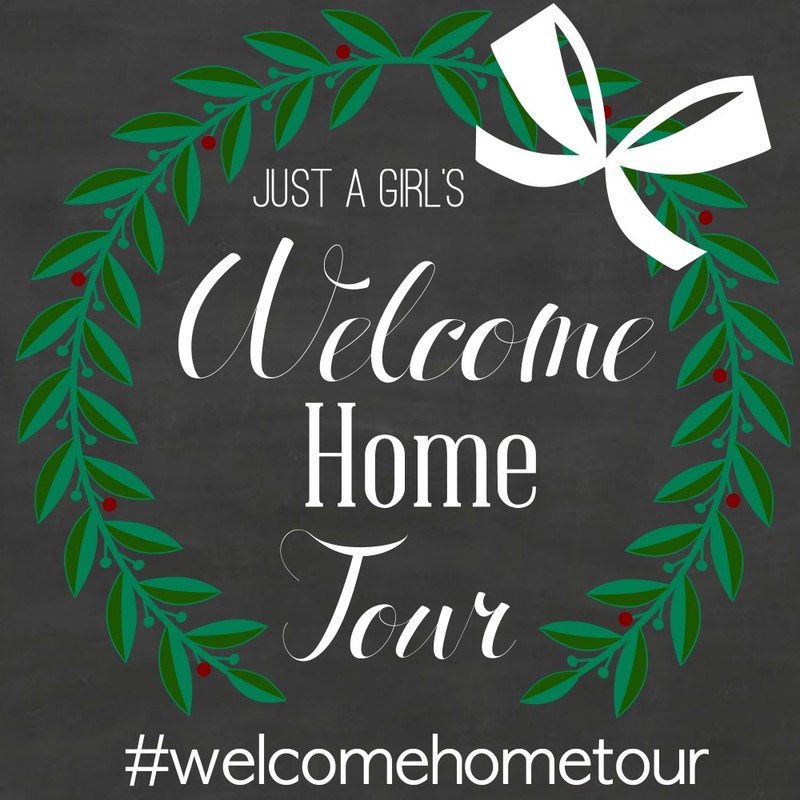 Today I'm sharing this year's Christmas front door as part of Just a Girl's #welcomehometour. 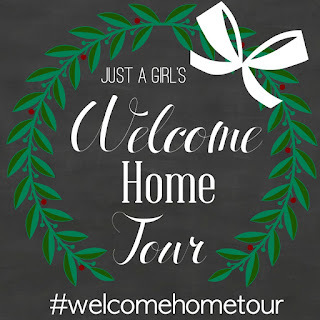 I'm so happy to be in the company of such an amazing group of bloggers - I can't wait to see how they welcome Christmas through their front doors! 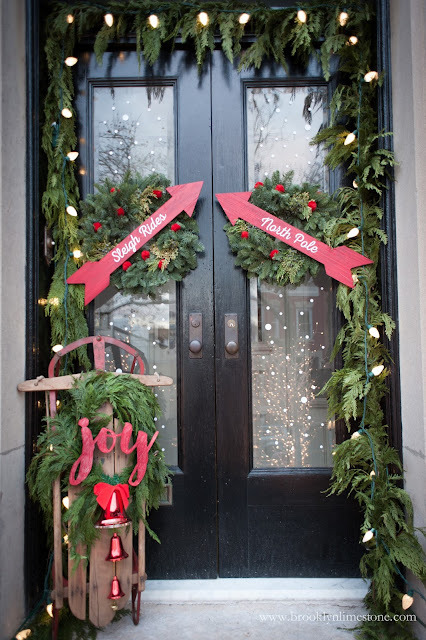 Pop over to Hi Sugarplum and 320 Sycamore to see their merry front doors today but the whole line up is inspiring. What in the? Is this even real? It's like a Christmas card! I'm clearly in love with it and would LOVE to come home to that every day! Thank you for joining! Wow! What a stunning front porch! I would definitely look forward to coming home to that scene every day. So beautiful! I knew your stoop would be stunning, but you still completely blew me away!! Just gorgeous, girlie!!! 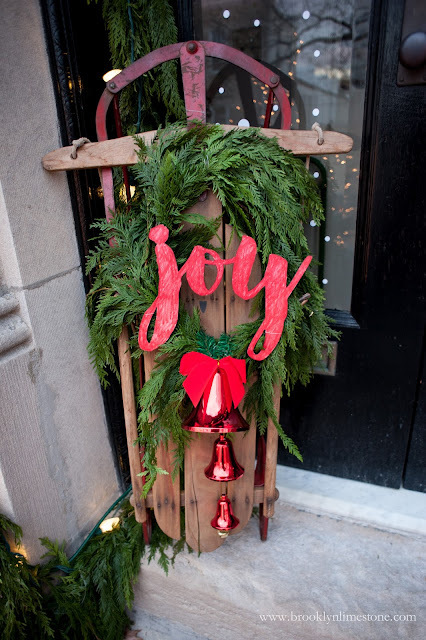 Oh, I love it all, a wonderful way to welcome people to your home. It looks so festive and pretty!! That sled, gorgeous and the Santa too. I bet your little one is loving it this year!! Merry Christmas to you! Beautifully classic and I love it. I just needed to add that your display is by far my favorite by a landslide. Gorgeous indeed! Beautiful and so very festive! Just lovely! 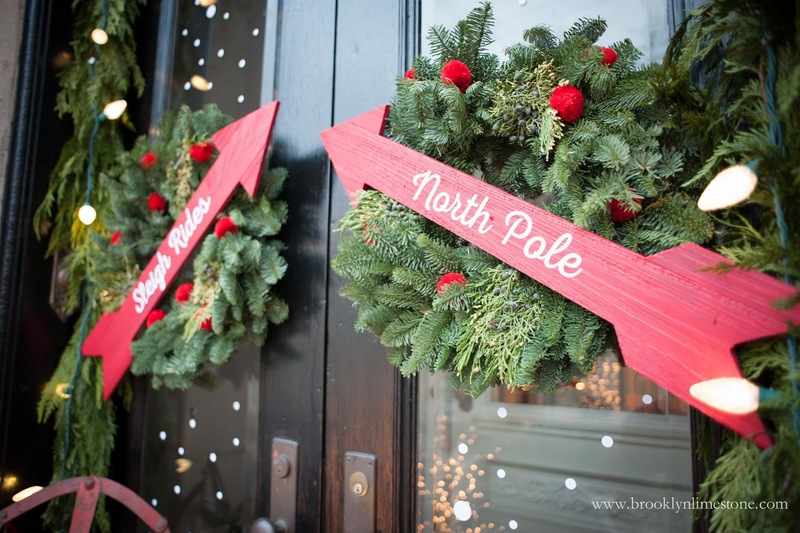 And I love your front door! It's so incredibly gorgeous! I love the red arrows!